Extreme Coastal Coaching is an individually tailored full day of personal and professional coherence development for those who are really ready to make significant life changes. Blending applied neuroscience, environmental psychology and philosophical debate; time and perception are two key discovery frames for the day. The shifting coast path locations punctuated by pausing for reflective activity and exercises establishes both a sense of transition and an appreciation of “NOWness”. Your coaching experience starts before you arrive with a short pre-coaching phone call to establish some of your aims. Once your booking is confirmed you complete a Littoral Wisdom online reflection exercise which asks a range of extra-ordinary questions to promote insights into your current: social, emotional, cognitive physical and spiritual orientation. On arrival we start with coffee and a check in – you will have likely stayed at one of our recommended hotels such as the Scarlett, so you will start your day refreshed and ready to explore. 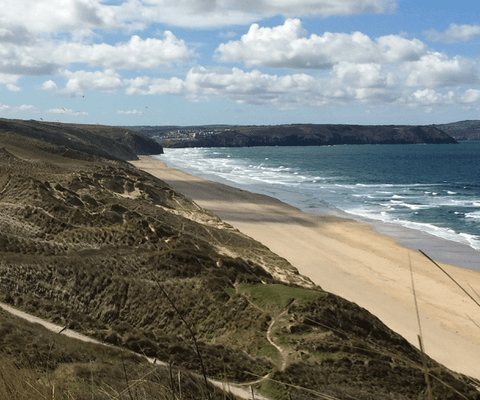 The coaching takes place along an 8 – 10 mile stretch of Cornish Coastline, so be prepared to walk and talk… although the terrain and pace are deliberately accessible. Self within context is a popular topic to explore. The subtle nuances and variability within the sky, sea, landscape and wildlife provide a distinctly analogue approach to making discoveries about yourself and your unique ecosystem. Questioning and developing ontological fluidity enables a less fixed sense of identity, less reliant on certainty and better equipped to navigate ambiguity. Whatever your current level of life satisfaction, this day will develop “positive trajectory led” existence, encouraging: ecological wisdom, purposeful intention and meaningful actions. Accessing awe: cognitively, physically and emotionally has been identified as a key lever for motivation, resilience and general wellbeing and with a passion for nature, our Cornish coastline is an inspiring coaching venue and playground. Amazingly awe has been proven to promote pro-social behavior too, an essential quality for a healthy life. Unsurprisingly failure to notice beauty within unremarkable objects and experiences, leads to feeling disconnected and cynical. The littoral zone can facilitate emergent metaphors and new perspectives leaving you energised with a new level of attentiveness, receptive to awe, open to your intuition and empowered to fully express yourself. Expect a day that is highly challenging, that said, humour is essential for all self-development, so the tone of the day is deliberate in its informality… including pub lunch! Individuals who are currently highly successful and wish to explore how to further enhance their self-awareness and coherence to continue expressing themselves fully within all areas of their life. People seeking to resolve some patterns and habits that no longer serve them well, focusing on enhancing future personal or professional performance. SME leaders or business founders opting to reflect upon strategic intent and direction throughout the day to ensure the way forwards is ecologically sound. Transitionals in the midst of substantial change looking to create new options, understanding and future pathways: relationships, parenting, graduates, career + retirement, relocation etc. Athletes wanting to align internal mind-chatter with physical efficacy, connecting mind and body for peak performance. Execs looking to build bi-annual / quarterly in depth reflection into their current personal / professional coaching package. Couples wishing to align their present and future; explore deeply their shared core values and strengthen their connection. Business partners who are aiming to balance compassion, creativity and courage in order to establish highly socially coherent enterprises. Essentially if you can conjure it – I can coach it. If you would like to know more contact me and make a decision that “the time is now” for positive change. The depth and intensity of this coaching means I allocate and offer a very limited number of full days each month for these personal transformation sessions. I have been facilitating these full day sessions since 2009 and this blog was first published in Sept 2010 – the coast is popular at all times of year to get outdoors, reflect and regroup… Get in touch if you think this might be for you.